William Morrow Paperbacks, 9780061778773, 272pp. When they decided to create The Council of Dads, Bruce Feiler and his wife, Linda, set down a few guidelines to help them choose a circle of dads. In reading their ideas, what appealed to you? What criteria might guide you? What parts of yourself would your Council of Dads (or Moms) embody? What values and life lessons would you want imparted to your children? If you were to compose a letter to your prospective Council of Dads, what would you say? What ideas would you include? Feiler writes of the men who influenced his own life. Who has been important to you? Who shaped or changed your life and what lessons did they teach with you? How can you share that insight with your own children? In addition to a council, what other tokens of yourself might you leave for your children so they can understand who you are, how you think, what you believe, what you hope for them? Have you, or do you, tell the people closest to you how you feel about them and what they mean to you? If not, what has stopped you? If so, how often do you tell them? One of the traditions the Feilers cherished with their daughters was airing "what happened bad" and "what happened good" each evening at dinnertime. Think about your day, even your week. Share the bad and good with your group, your family, your friends. What does examining the events of our daily lives offer us? The author interweaves letters from his cancer year with vignettes of his council members and important people and events from his life. How do the three narrative elements enhance each other and the story itself? 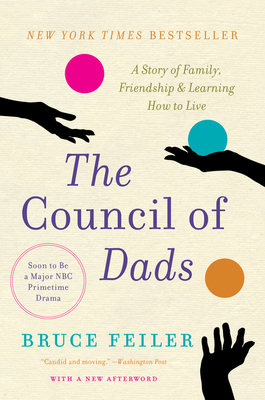 What did you discover about the author from The Council of Dads? What kind of a man is he? What does he cherish? What is his outlook on life? What matters to him? How can you apply his feelings, thoughts, and insights into your own life? If a child asked you the question, "how should I live?" how would you answer? Why do Americans have trouble talking—even thinking—about mortality and death? Might our lives be richer if we talked more openly and more often about the subject? How has the nature of fatherhood—and motherhood—changed from the author's grandfather's generation to his own? Supplement your answer with examples from your own life. What did Bruce Feiler learn from this experience? What did you take away from it? What affected you most in reading The Council of Dads? What inspired you?